Three Girls: Happy Birthday To You! Sarah Jane is TWO! 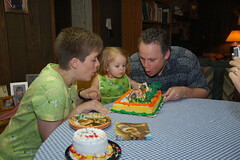 We had a great time at her party - eating all her favorite foods... hotdogs being the centerpiece! Sarah Jane got some great presents but unwittingly let Anne Marie have the best thing she got - the tissue paper from the gift bags. You can check out our Kingsport pictures here.